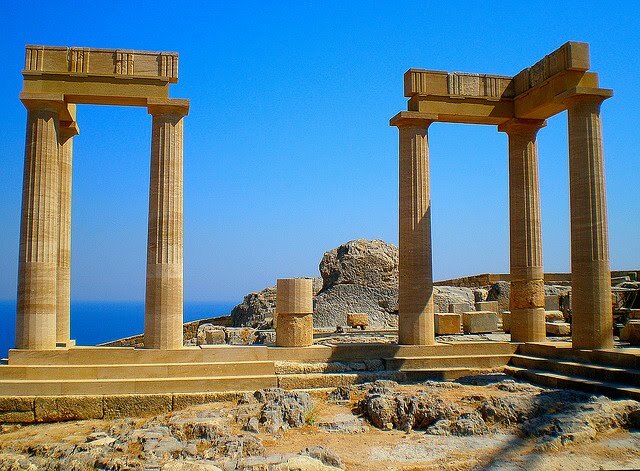 Rhodes (Rhodos or Rodos in Greek), lies between Crete and the near East in the Aegean ocean. Rhodes is famous as the island of sun, sea and sand, the ideal place for vacations. It is the third largest Greek island, the biggest of the Dodecanese islands, and officially, the sunniest place in the Europe. The City is among the finest, not only in Greece but in the whole of the Mediterranean. There are many reasons why Rhodes is one of the most popular resorts in the Mediterranean: the natural surroundings (crystal clear seas, many parks and recreational facilities), the bright sun and the warm hospitality of the islanders themselves. The city has an excellent tourist infrastructure and offers a wide variety of entertainment : night-life, sports, cultural events, and day trips to wonderful Lindos and the neighboring islands like Symi, Chalki, Patmos, Karpathos, Tilos, Leros. It is situated at the island’s most northerly point and ringed by sea on the east and west. Rhodes (Rodos in Greek) combines the cosmopolitan character of a contemporary city with the picturesque of the medieval town, which gives the impression of having been untouched by the passage of time.Rich with myths and restless history is surrounded by small islands and rocky un-inhabited islands that are shyly trying to steal from her beauty.Rhodes is also well known for the famous Colossus of Rhodes, which is one of the Seven Wonders of the World.This island is the largest island in the Dodecanese Island group of Greece, both in land area and in population. Rhodes offers the visitor a plethora of all year round leisure alternatives, covering all types of tourist activity. Visitors have the opportunity to learn something of the eventful history of the city, visit the museums or go sightseeing and the sport lovers will find here a paradise on earth for activities such as swimming, fishing, water skiing, windsurfing and sailing. * Some of the information have borrowed from the Municipality of Rhodes website.